I make a very public body of art using stickers, posters, and stencils. I put these works on the street in order to send some static interference out into the world’s sea of images and messages. 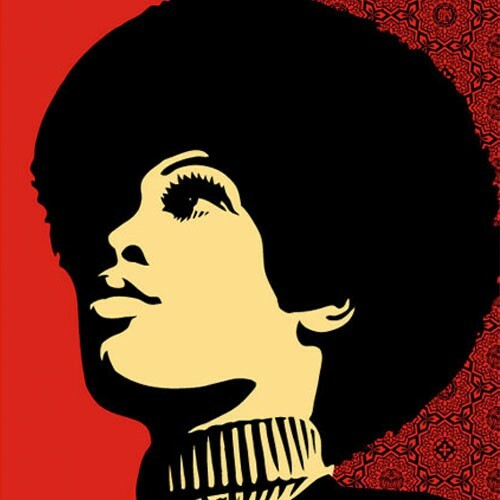 The images I use include historical propaganda, black power, parodies of authority, and tweaks of popular culture icons. What’s the point? Well aside from satisfying my compulsive need to produce art, these posters are designed to start a dialogue about imagery absorption. Powerful and seductive images have historically been used for a variety of reasons, some noble, some sinister, some both, depending on subjective interpretation. My work uses people, symbols, and people as symbols to deconstruct how powerful visuals and emotionally potent phrases can be used to manipulate and indoctrinate. There is no specific political affiliation behind what I do, only the philosophy “question everything”, which is why I can use Jesse Jackson and Joseph Stalin in the same body of work. I also use the word “Obey” in much of my art as a form of reverse psychology. Though most people wish they were independent, many obediently follow the path of least resistance and are uncomfortable with confronting the word “Obey”. As disconcerting as the word “Obey” may be, when not attached to any further command, it poses no threat beyond forcing the viewer to face their feelings about obedience. Though my art may make some people uncomfortable, I’ve always felt that provocation stimulating debate is much more desirable than ignoring sensitive issues to avoid hurting anyone’s feelings. People’s feelings do seem to get hurt very easily. Sometimes I’m attacked by people who tell me I have no business using this leader, or that activist, or this word, in my art. What surprises me most is that sometimes those who criticize my use of symbols aren’t the ones that lived through McCarthyism and have a programmed fear of communism or anything radical, but those who claim to be radical. Many of these so called “radicals” have adopted Politically Correct doctrine that says white people have no right to try to relate to, or comment on, other cultures. I think this is a dangerous mentality that discourages inter-culture relations and understanding. Sure, a white person can’t truly relate to what it is like not being white, but the sentiment to try is at least a positive step. Che Guevara and Bobby Seal both embraced the assistance of those Gringos or Crackers that genuinely understood their causes and wanted to help. Distrust of those who have oppressed is natural but intentional isolation only fuels racial tension. Does the Latin community own Che? Does the Black community own Angela Davis? Does the White community own Eminem? Should Hip Hop and Graffiti be kept only in New York City? My point is that someone or something’s influence can often cross cultural boundaries and grow beyond the control of groups who would like to keep this person or thing as a symbol solely of their cause or culture. Figures are used symbolically for group’s agendas, simplifying them in a way which can never truly reflect the complexity of the individual. I use figures in my work who I feel are used and abused as symbols, but without telling the viewer how they should feel about them. I hope people that don’t know the backgrounds of these leaders, radicals, pop icons, or movements will take the initiative to learn about their history. I apologize to anyone who feels my work desecrates something they hold sacred, but things aren’t always as black and white as some folks wish they were. Digest this: Che Guevara was from an upper class family of pure Spanish descent and considered himself white, yet he took on the mission to empower mixed and native Latin Americans. Che struggled to free Latin Americans from European and American oppressors with whom he admittedly shared a common lineage. Fortunately, P.C. rhetoric didn’t make Che feel he lacked the racial credibility to be outspoken about his causes. This anecdote leads to my advice to myself and others; Investigate and deconstruct everything because a person and the simplified symbol they have become aren’t always the same thing.